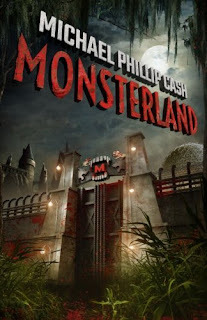 Just in time for the scariest day of the year, here’s your chance to win the newest book from Michael Phillip Cash – Monsterland! I haven’t even had the chance to read this one yet, and one lucky winner is going to win a SIGNED copy – AND a $200 Dave and Buster’s Gift Card! Keep reading to learn more and then enter below for your chance to win! October hosts a myriad of fun things to do and visit. What if one of those things was to visit a theme park full of monsters? Would you go if you were invited? Welcome to Monsterland – the scariest place on Earth. All guests can interact with real vampires in Vampire Village, be chased by an actual werewolf on the River Run, and walk among the dead in Zombieville. Wyatt Baldwin, a high school student and life-long movie buff is staring bleakly at a future of flipping burgers. Due to a fortuitous circumstance, Wyatt and his friends are invited to the star-studded opening of Monsterland. In a theme park full of real vampires, werewolves and zombies, what could possibly go wrong? 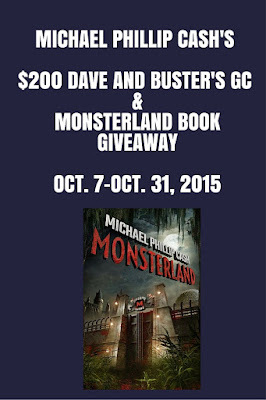 To introduce this book, Michael Phillip Cash is generously giving away a signed copy of his book along with a $200 Dave and Buster’s gift card for a howling good time! Enter in the Rafflecopter below for your chance to win. Good luck! Michael Phillip Cash is an award-winning screenwriter and novelist. 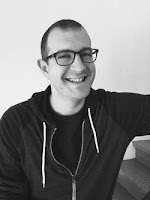 He’s written eleven books including the best-selling Brood X, Stillwell, The Flip, The After House, The Hanging Tree, Witches Protection Program, Pokergeist, and Battle for Darracia series. Michael resides on the North Shore of Long Island. He writes full-time with his own screaming monsters in the background. Disclosure: Dividing by Zero was asked to promote this giveaway on behalf of Michael Phillip Cash and Away We Go Media and was not compensated in any way. This giveaway is open to U.S. participants only. You must be 18+ to enter. Winner must respond within 48 hours to an email sent or an alternate winner will be chosen. Winner will be chosen at random by Rafflecopter.org. All entries will be verified. 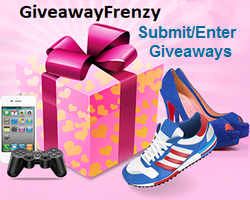 This giveaway is not associated with Facebook, Google,Twitter or any other social media outlet. I would create a monster with red eyes, wings, and black fur. I would be the monster as a witch with a dragon. My monster would be very ugly, but with a big sweet heart! I would create a monster that was very pretty and very nice. I would create a monster that looked like a nice clean-cut regular person that people wouldn’t be suspicious of who could immediately morph into a hideous beast! I would create a monster that would be half bird and half clown.. yup scary. He would have a lizard-like tail with his spine partially protruding out of his back. He would have long pointed teeth and his jaw would dislocate like a snake’s. He would have muscular human arms and his fingers would be long with long talons. His eyes would be blood red. And he would be fast. Cookie monster, as I love food! I would create a monster that looked like a normal person that could morph into anything else. OOOOH. It would look like a doll with a cracked up face and missing parts. If you would create a monster, what would it look like? I’d create a monster who looked like a normal human, to me the worst type monster there is is a human one. I’d create a cute monster that kinda looks like a Critter! I love that movie, and thought they were kinda cute….til they got hungry! If I were to create a monster, I would create a friendly looking monster. He would have a tail, fur, and be colored red. I’ve always been a bit scared of the La Llorona type monster.